Whether you are planning a white water rafting trip, or a fishing foray with friends, the Tag Heuer Aquaracer 500 Meter Calibre 5 WAJ2180.FT6015 Mens watch always comes in handy. With the water resistant up to 1650 feet function to the rubber strap with diving extension system and safety push buttons, this sturdy timepiece will do the job. This finely crafted Swiss made watch lives up to the Tag Heuer tradition and will not disappoint. 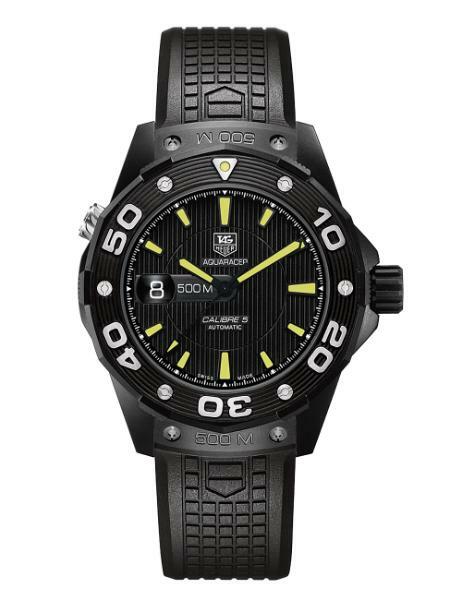 The Tag Heuer Aquaracer 500 Meter Calibre 5 Mens Watch WAJ2180.FT6015. 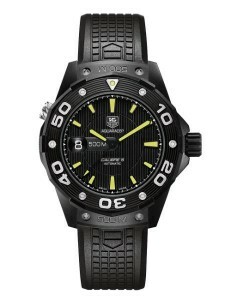 From the Tag Heuer Aquaracer series. Rubber strap with diving extension system and safety push buttons. Helium escape valve at the 10 o’clock position. Caliber 5 engine, with Swiss movement. Round black dial with white hands with luminous hours, seconds and minute markers. Black PVD stainless steel 43 mm case. Skeleton screwed down case back. Unidirectional rotating molded black rubber steel bezel. Black rubber bracelet with a deployment clasp. Date display at 9 o’clock position. Water resistant up to 1650 feet. Tag Heuer outdid itself with the creation of this gentlemen’s watch. If you are looking for everything water sports, this watch fits the bill. Though it may be difficult to break this watch, the rubber band may not last as long as stainless steel. Though the dial details the hours, minutes, and seconds, for some the time may be difficult to read with no numbers. If you are looking for just a plain watch with basic functions, this watch probably isn’t for you. 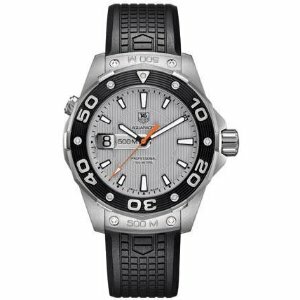 The Tag Heuer Men's WAJ1111.FT6015 Aquaracer 500 M Watch. Some watches in the Tag Heuer Aquaracer collection do come with stainless steel bands. The TAG Heuer Men’s WAJ1111.FT6015 Aquaracer 500 M Watch doesn’t come with a stainless steel band, but the silver dial makes for a great contrast to the WAJ2180.FT6015 Aquaracer’s black face. The WAJ2180.FT6015 can be found on Amazon for $1,876.25, and there are several great reviews to help you get the buyer’s perspective. It is out of stock at Joma Shop and will be available to buy at Bluenile in 4 to 6 weeks. There are quite a few alternate online places selling this luxurious watch. If this watch fits in your budget and water sports is your thing, then this watch may be what you are looking for.